The Health Center Is Open! The Uintah Basin Medical Center has hired Rhonda McKenna as the new Physician's Assistant. The clinic is open on Monday, Tuesday, Thursday and Friday from 9:00 a.m. to 12 noon and 1:00 to 3:30 pm. The Office will be open 5 days a week from 9 a.m. to 12 pm and 1:00 pm to 5:00 pm. To make appointments please contact the clinic at (435) 784-3575. 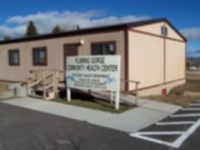 The reopening of the Health Center is the result of a partnership between TriCounty Health, Daggett County and the Uintah Basin Medical Center. Equipment and renovations for the facility were partially funded by Permanent Community Impact Fund Board. For Life or Death Emergencies call 911, for other non-life threatening services needed please contact the Clinic during business hours. TriCounty Health Department currently offers dental services and a health nurse. The dentist, Dr Giauque (pronounced Juke), visits the Clinic once a month and can be contacted for an appointment at (800) 400-1456. The TriCounty Health Nurse visits every other Wednesday between 10 and 11:30 am and 1 to 3 pm. She can be reached by calling (435) 784-3494. The Home Health Nurse is beginning for those who have been hospitalized and need assistance when they return home. Ask your doctor for more information before discharge or contact the Health Center at (435) 784-3575.